Where: On any gravel road. 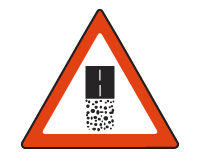 Purpose: To warn that the gravel road you are travelling on will end ahead. Action: Look out for an asphalt, tar or concrete road ahead.